Will Tehran spoil Moscow’s push for peace in Syria? 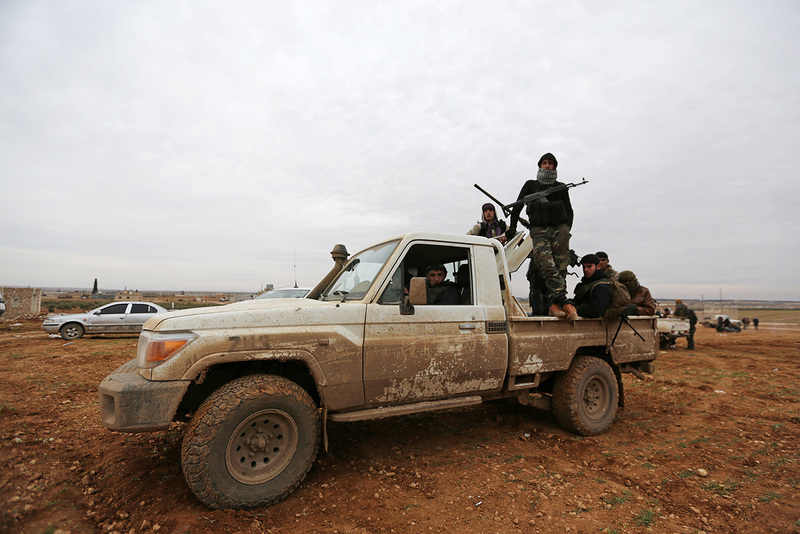 Rebel fighters ride a pick-up truck on the outskirts of the northern Syrian town of al-Bab, Syria Jan. 14, 2017. Tehran has unexpectedly taken a tough stance against Russia’s invitation to the Americans to attend the Syrian peace talks in Astana. This is a clear sign that Iran will pursue its own regional agenda regardless of Moscow and Ankara. Next week’s peace conference in Astana, Kazakstan has the potential to end the five-year old Syrian civil war. But chances of success are now looking fragile. Syrian President Bashar al-Assad is eager to negotiate a ceasefire and reach an agreement with the opposition that loathes his government. However, it’s uncertain whether the “moderates’ will tolerate Assad for long. Likewise, since they already have the upper hand, Assad and his Iranian allies might be tempted to seek a decisive military victory. These seemingly insurmountable obstacles make the trilateral initiative organized by Iran, Turkey and Russia look like a very risky enterprise. Basically, Tehran derailed Moscow’s gesture aimed at improving relations with the new U.S. administration. It’s unlikely, however, that Iran deliberately wanted to confound Russia. Instead, the problem is specifically with Donald Trump. On several occasions during the election campaign Trump criticized the Joint Comprehensive Plan of Action (JCPOA) – which is the agreement on Tehran’s controversial nuclear program signed between Iran and the 5+1 group (the U.S., Britain, France, Germany, Russia and China). Trump hinted that he might scrap the agreement or renegotiate it, and seek a better deal. President Hassan Rouhani recently dismissed the idea that the July 2015 nuclear deal could be unilaterally scrapped by the U.S., and he pointed out that the JCPOA was a multilateral agreement that cannot be discarded because of one member’s ill will. As a proud and dignified nation, Iran resents disrespect from foreign states and politicians. This is even more pronounced in the case of the U.S. because of the tense history between the two countries. Tehran’s current fit of wrath against the U.S. has three major sources. First, Iran resents Obama’s support for the war launched by the Sunnite Gulf monarchies against the Alawite regime in Syria, because the later have a common faith with Iran. The West and its Sunni allies demand Assad’s removal from power, but for Iran this is non-negotiable. Assad’s fate, however, also has Tehran and Moscow on different sides. Russia made it clear that it’s no pillar of support for Assad, and that his political career should be decided in a democratic way by the Syrian people. Why is Russia fighting in Syria? Second, whatever happens in Syria or Iraq is viewed by Tehran through the prism of the conflict between Shia and the Sunni - Iran and its allies versus Saudi Arabia and its followers. Since the U.S. traditionally sides with the Sunnite monarchies, Iran follows the rule: the friend of my enemy is not my friend. Third, technocrats in Tehran need to prove their anti-American credentials for domestic consumption. After the death of Ayatollah Ali Akbar Hashemi Rafsanjani, the virulent feud between the religious fundamentalists and modernisers within the Iranian ruling elite has intensified. Tehran’s latest spat with Washington might damage Iran’s interests, and thus it could be persuaded to reconsider its stance. Why? By objecting to the presence of an American delegation at the peace talks Tehran is pushing the U.S. back into the embrace of its formal yet rather untrustworthy ally, Saudi Arabia, which of course is Iran’s arch-rival. Both want ultimate supremacy in the region. Any lasting and long-term solution to the Syrian civil war requires the consent, or at least the benign neglect, of global power brokers such as the U.S. Moreover, there is a high probability that Donald Trump is purposely raising the stakes vis-a-vis China and Iran. As a shrewd businessman, Trump could be applying proven tactics prior to tough negotiations: up the ante; show an aggressive attitude; set forth seemingly unacceptable preconditions, which once rebuffed, could be dropped. There is also a nagging suspicion that the Rouhani team, which has a reputation of being flexible when there is no other option, is mimicking the abrasive style of the new U.S. president. In any case, the Astana peace talks are a first step in the right direction. Read more: Will Russia, Turkey, and Iran bring peace to Syria?